Mosaic stepping stone molds are used in making stepping stones. Mosaic stepping stones made with a mold are a very good beginner project. They do not require the use of glue or grout and can be completed in a couple of hours. Just add concrete in the mold, then press your mosaic stepping stone tile in the wet concrete and release it from the mold when the concrete has dried. Stepping stone molds come in a variety of shapes and sizes, prices start at just over $2.00 for a 4 inch mold. Below are 2 shapes, clicking on the buy button will display the complete line of stepping stone molds. Make your own garden stepping stones with unique designs. 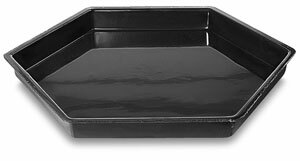 These reusable, high impact plastic molds have beveled edges and rounded corners to release stones from the molds with ease. Note — Mosaic pieces and cement are not included. 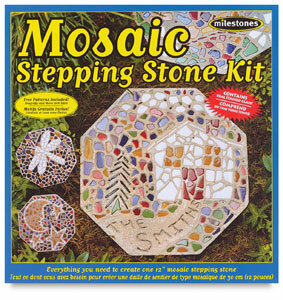 For under $20 you can also purchase a mosaic stepping stone kit. Everything needed to create one 12 inch diameter mosaic stepping stone is included in this fantastic kit. The process is so simple. Just mix, pour and decorate with real stained glass mosaic pieces. The kit includes 7 lbs of stepping stone mix, a 12 inch reusable plastic mold, wooden paddle, a writing tool, 1 lb of mosaic pieces, instructions, patterns, and design ideas. 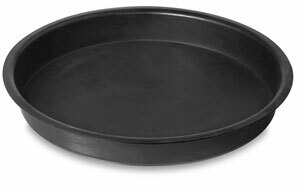 Conforms to ASTM-D4236. If you are wondering how to create stepping stones just go to the mosaic stepping stones page for instruction on making mosaic stepping stones.